Nancy’s ‘core’ wardrobe consists of 12 mix-and-match items (4 under-layers, 3 over-layers, 5 bottoms). Of course she does’t expect us to live in just 12 garments ! Even though she shows so many variations we could wear a different outfit every day for a whole season. 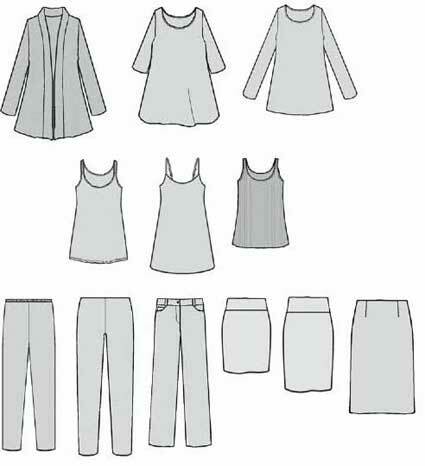 Nancy also shows how to add items so they expand the wardrobe options. Instead of becoming orphans. She relaxes the rules : extras don’t have to co-ordinate with absolutely everything you already have ! Basics are clothes that mix-and-match without much thought, and can be worn on most occasions you find yourself in. Extras still need to make part of several outfits, but they can be more individual. Nancy’s examples continue with the same classic shapes, and add some classic relaxed styles : jeans, shirt, and a drape front knit cardigan. Three new colours and another print ! Under- and over-layer in accent colour 2. Under- and over-layer in accent colour 3. – pairs of related under and over layers. – colours which combine with the colours you already have. Nancy chooses two more sweater sets. Sleeveless shell and over-layer that closes to the neck. Such as Silhouette Patterns 195 Sweater Set. Nancy chooses knits with texture, frills, and sleeve length variations for added interest. You haven’t got to continue with the same styles as your original core. This could be the place where you add tops for different occasions – tee and hoodie for exercise, knit top and shirt-jacket for relaxed casual. 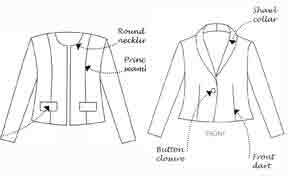 Keep your blouse and jacket for looking competent or formal. 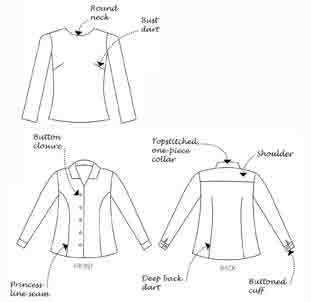 Add a shirt which can be worn either as an under- or an over-layer. Gives a huge number of options. For this, the shirt needs to have unfitted waist – made from a casual-dartless block. to sublime elegance such as Chado Ralph Rucci Vogue 1215 (below) or Vogue 1054. 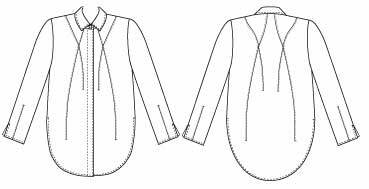 Male Pattern Boldness has had a shirt sew-along with many tips. For fabric, Nancy uses another print that combines your first colours (darker and lighter neutrals and accent), for maximum co-ordination and interest. 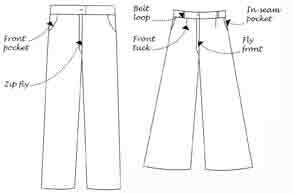 Pattern Review have 85 pages of tips in a jeans sew along for this pattern. Male Pattern Boldness has also had a jeans sew-along. There are tutorials on making the front pockets here. And Jennifer Sterns’ jeans pattern gets many good reviews for the instructions. Judith Rasband in ‘Wardrobe Strategies for Women’ says jeans aren’t basic, because you can’t wear them at any time in any place without wondering if you’re appropriately dressed. 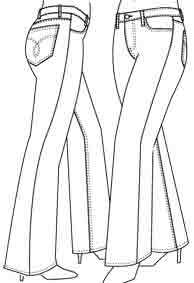 Your preference for casual pants might be chinos, such as Palmer-Pletsch McCall’s 6361. Or yoga pants, perhaps Palmer-Pletsch McCall’s 6082. Your second darker neutral does need to ‘go with’ the first, if you want maximum co-ordination possibilities. But it gives you the option to add a new frequently-worn colour. For styles, Nancy repeats the basic classics. Her ‘Core 4” consists of under-layer, over-layer, skirt and pants, see first post in this group. 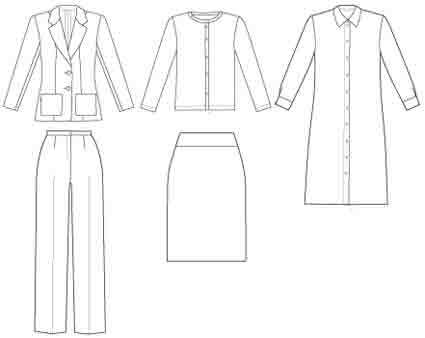 You might choose any wardrobe pattern which includes all your core items. – make all four items in a closely related colour group. – link the colour and textures to what you already have. – choose styles that make the look more casual or more professional, prettier or more edgy, but not so different that they look incongruous combined with the other clothes in your main ‘core’ wardrobe. Nancy’s final piece is a drape front knit cardigan. In a lighter colour related to your second dark neutral. This is a modern casual classic, with many patterns. Jalie 2919 was one of Pattern Review’s top patterns for 2010. Simplicity 2603 was one of Pattern Review’s top patterns for 2009. 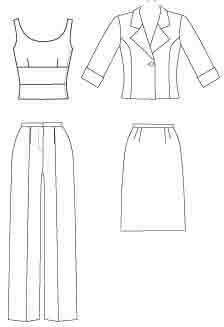 These patterns both have a long front drape. A short cascade front looks better on me, see my post on cascade jackets. Nancy ends Lesson 27 with a summary of the complete wardrobe. In Lesson 28 she makes some suggestions about choosing your group of clothes from your own closet or shopping. Nancy has added 11 garments to her core 12. Making 23 garments total. All fit onto a short hanging rail ! And she stopped counting how many hundreds of different outfits she could make. – two sweater sets in accent colours. – another ‘Core 4’ in a second darker neutral or ‘basic’ colour. – casual pants (jeans) in your first darker neutral. – ‘casual/ dartless block’ shirt, in a 3-colour print. – drape front knit cardigan, in a lighter colour related to your new ‘Core 4’. Well, don’t leave these ’til last if you need casual clothes ! As usual, all Nancy’s ideas for combinations and styling with accessories are thought provoking and inspiring. If you follow Nancy exactly, you’ll have 7 shells, 8 over-layers, 4 skirts, 4 pants. In 3 neutral/ basic colours and 3 accents. Want to go in another direction ? 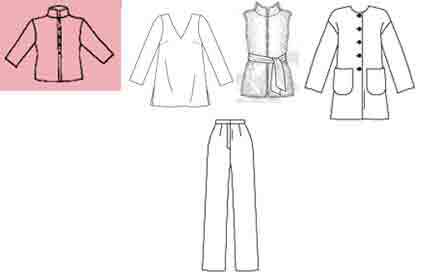 There are several interesting suggestions for small groups of garments, ‘capsules’, in the Wardrobe Builder section of the Petite Plus patterns site. These ideas can be used by anyone, not just people who’re that shape. Nancy hasn’t included ‘statement’ pieces. These are of course very individual. Instantly recognisable, not co-ordinates. But they still need to relate to your basics in colour and shape, so you can wear them !